Amazing patio view, hammock and loungers included! Waterscape C505 is located on the Florida Panhandle in the Destin/Ft. Walton Beach area and is one of the most popular resorts on the Gulf Coast. We are a 2 bedroom, 2 bath condo with all the perks you'd expect from a 5-star resort, plus many that you haven't yet considered. Located in the desireable "inside" of the U, our condo overlooks the resort and is naturally equipped with a beautiful beach view. Both the living room and the Master bedroom take full advantage of the scenery and open to a spacious patio that includes seating for 4, a hammock, and a lounge chair for you to do just that: lounge. We offer a fully-stocked kitchen making cooking-in a breeze (but of couse, this is optional!). The living room has a full-size sofa that converts to a Queen size tempurpedic-topped sofa bed, a love seat, and an HDTV in case you need to spend some down time indoors. Our dining area features a table for 6, but we also have a bar table in the kitchen with 2 barstools, so that seating for 8 is provided. C505 is colorful and classy, offers a beachy charm, and feels like home. We have selectively stocked the condo with things you need, but nothing you don't. 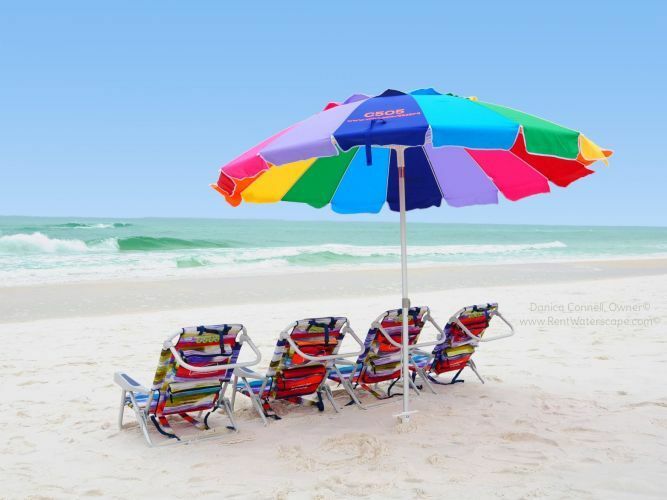 We offer 4 beach chairs, a large 8' umbrella, and a beach cart to provide front-row beach seating at your leisure. This equipment is also handy at the pools, as sometimes vacant chairs can be difficult to come by. We furnish an all-terrain wagon for your little ones, a pack-n-play, high chair, and a small selection of beach toys. These are a few of the details, but I don't want to spoil all the fun! Waterscape C505 contains the resort's cutest bunk room. The flamingos and lantern lights put you in the right mood and make the babes happy to get into their sleeping quarters. Our bunk room features a light blocking and sound insulating curtain, making sleeping in a breeze. This unit sleeps 8 people comfortably. The unit sleeps 8 people comfortably. Master BR has a king sleep number bed. 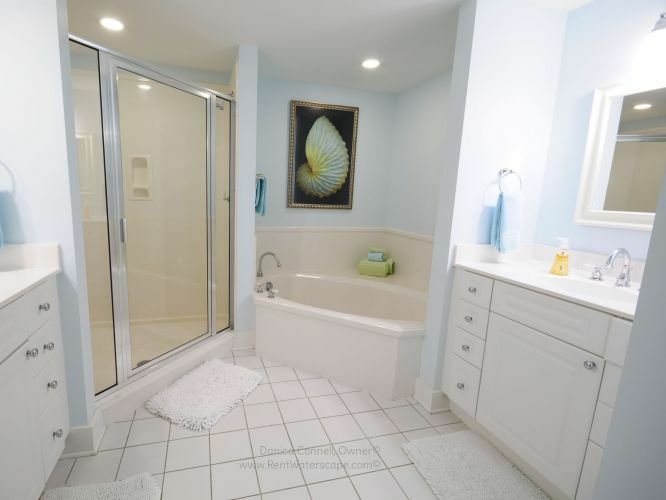 Master bath has double vanities, a walk in shower, and a large bathtub. Guest BR has a queen sleep number bed. Guest bath has a single vanity and walk in shower (no tub). Bunk Room has bunk beds and a light-blocking privacy curtain to keep your kids soundly sleeping. Living room has a queen size Tempurpedic sofa bed. Check out this AMAZING 3D Tour!! Move around the resort with your finger/mouse as if you were standing there. The arrows will move you to another room. More details: To book this property you will need to contact me to make sure I don't have another contract in progress on your specified dates. I will email you a contract and give you 7 days to return it along with the deposit. The deposit holds your reservation until your rent is due, which is one month prior to your arrival. A check is my preferred method of payment, as it leaves a paper trail for us both. The $250 deposit is returned promptly upon a tidy check-out. We had a wonderful stay at this condo. It was clean, clutter-free, organized, and more well-supplied than any place we have stayed. The owner is thoughtful of your every need! Our two small children enjoyed the splash pad and pools. We enjoyed using the provided beach cart, wagon, chairs, toys, floats, board games, and DVDs that the owner provides. Parking only steps from the door of the condo is a MAJOR bonus, as well. The whole resort is family-friendly, but we will rent from this particular owner again. Great place to vacation! The pools and the beach we're great. Danica's place was great. Fully stocked with blender, dishes and silverware. I took many items that were already there. I felt completely at home and wished we could stay another week. We will be returning!!!! What a nice change of pace! We chose Waterscape C505 for our stay because (1) The condo we own on Okaloosa was occupied (2) I needed a break from condo maintenance (3) This place looked awesome! And it was...especially since we were bringing our grandson (9) and his buddy for their spring break trip. The condo's water features were a huge hit and the bunk nook kept them from being underfoot all the time. 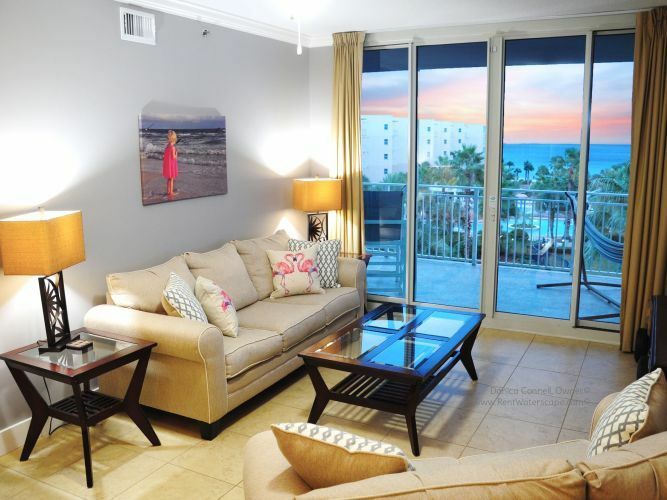 Danica provides excellent service and her condo is the perfect family option for your beach stay. Nicest Place on the Gulf! This is by far the nicest place we have stayed on the gulf. With hurricane Michael threat we were delayed a couple of days however, dealing with Danica Connell has been the best experience ever. These units are privately owned and are beautifully decorated and well taken care of. Everything you can imagine is fully stocked in the condo. Save Service Fees and use the money for your entertainment. We stayed in Waterscape C505 with four 15 year old girls. Plenty of room and privacy and the hammock on the balcony is a plus. Owner Response: Rita, thank you for noticing the service fees. Not everyone realizes that booking on VRBO (aka vROB) now costs you a couple hundred bucks in "service fees." The owners have no control over this fee and we cannot take you around it, because they hide both our contact info now. It's disgusting. I'm so glad that you booked direct and I encourage everyone to always find the owner and book direct! You will save a chunk of change. And PS. I left VRBO over this mess. It's disgusting that they would put their hand out for that much money when someone books MY property through ME when I do all the work. No thanks! This is by far the best owner I have had the pleasure of renting from. Danica makes you feel as if she is your very own travel agent-suggestions on where to eat, places to visit and of course about the many wonderful amenities at Waterscape. We rented B112 and loved being only a few steps to the beach and pool! The temperature was a bit cooler but we still had a few beach days and there are many nearby indoor activities! Thank you Danica!! Absolutely amazing time at waterscape C505. We hardly left the resort , everything you would need is provided. Great pools and easy beach access. We will be back! October Vacations are the Best! We love staying at Waterscape and in C505. This unit has it all. Beach chairs and umbrella, toys for the kids, rentals provided for paddle boards. My kids were so excited with this complex and this area of the beach. It was all amazing. We can't wait to go back. Thanks Danica for thinking of everything we would need for a great vacation! We had an amazing time at Waterscape C505. The unit was extremely clean and well stocked with everything that we needed. Danica was so easy to work with and available for any questions that we had. We will definitely recommend this unit to our friends and will look to stay here again in the future. C505 was a beautifully decorated, super clean condo and Danica goes above and beyond to make it feel like â€œour home away from home!â€ WaterscapeC505 is a great view of the toddler pool where my 3 year old played hard and had an absolute ball!! It truly is a toddler paradise and great family vacation spot!! Danica made everything super easy from renting, checking in, giving tips and recommendations, and checking out! She is by far the most thorough and the best owner I have ever worked with!! Will definitely recommend WaterscapeC505 and Danica!! Hope to be back in the near future!! Thanks again for helping us make memories that will last a lifetime!! C505 was a DREAM. There are a lot of extras and it’s the little things that all add to up an amazing total package. It was great to have chairs, umbrella, and cart to use and not have to pack all that bulky stuff. Kitchen was well stocked with everything I wanted/needed. I don’t think I realized when booking that we parked in a parking deck. That’s great...but you park on your floor, right in front of your condo door!!!! SUPER easy for loading/unloading, running to car for forgotten items, and not having an elevator ride to leave unit. My family and I had a wonderful time relaxing at the beach. Our kids had so much fun playing at the different pools. The condo was just like home. I would very highly recommend to anyone to stay with Danica during your vacation. You will not be disapoointed. Our vacation here was awesome! Our condo was decorated so nice, very clean and had everything you could possibly need. Danica was great to work with. She is so organized and helpful. Before we arrived she emailed us a packet with everything and anything that you would need to know. From what is at the condo, great places to visit and eat, even a list of channels on the TV and much much more. She even offers a service that your groceries can be waiting for you when you arrive for a very cheap fee. Which is definitely worth it! No one wants to go grocery shopping when you get to the beach! :) If you have kids this is the place to go. Very kid friendly. There is a lazy river, two pools, lily pads for the kids to climb across. A splash pad with a small water slide. Danica even adds an extra package included in your rental with unlimited paddleboards and kayaks, and provides her own chairs and umbrellas for the beach. Most rentals only give you 1hr a day on the kayak or paddleboard. She really goes above and beyond on making your stay great! I highly recommend booking with her. We just went on vacation there last week and are already planning our vacation to one of her condos next year! We recently stayed in unit C505. We had an amazing week. The condo had everything we needed for restful sleep, meals, and beach supplies. The pools and beach area were perfect for our group. We enjoyed and were amazed by our access to kayaks and paddle boards from our beach area. The owner, Danica, was wonderful to work with and seemed genuinely excited for our group to have a fun trip. We will definitely be back! Trip was amazing! We stayed in C505 and walked into a spotless condo with music playing and an added bonus was the monogrammed beach towels for the kids! The kitchen was well stocked with all pots/utensils needed (except for a rice cooker😉lol south Louisiana needs rice🤣). It was so nice to have our own beach chairs and umbrellas bc you were able to set up exactly where you wanted and not where beach service set up everyone else on top of one another! The paddle board at no additional cost was so nice. Kids had a blast and kept them entertained for hours just trying to stay up. Any questions I had were quickly answered by Danica and I have already booked for next year. I highly recommend her condos- the experience was so easy and can’t wait for our next trip. Thanks again! We had the most wonderful vacation at your waterscape C505 Everything we could ask for was at our disposal The unit is completely stocked with all the comforts of home and more. We are looking forward to our next visit there in the fall Love, Love, Love this place!! We vacationed at Waterscape C505 for the second time this year and it was fabulous! Not only is the resort amazing, but Dannica really makes the condo a home away from home. We have 2 children and she provides everything needed to make so many wonderful memories from personalized sand buckets upon arrival to a high chair and wagon for transporting everyone and all their stuff to and from the beach. The condo is very nicely furnished and Dannica is very responsive to any questions during the stay. We will certainly be back again! Paradise Found! 5 stars is not enough!! We have stayed in one of Danica's condos for three years now and have year four booked. I cannot say enough about how wonderful every experience has been with Danica and her condos. Having stayed in C205 & C505 I am convinced there is no place better. From opening the door everything has been thought of to ensure a wonderful stay. 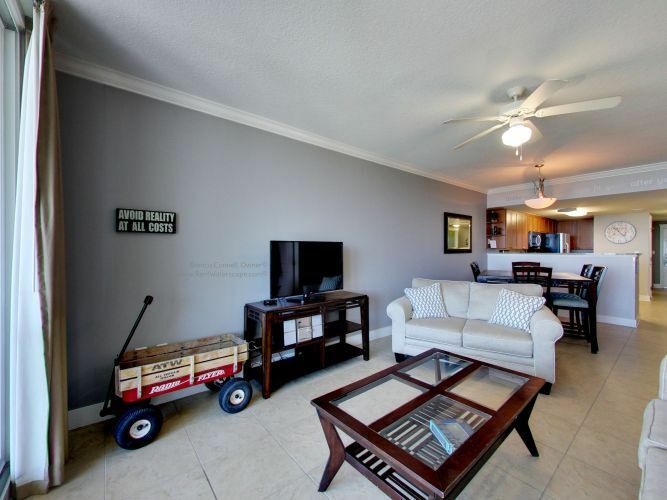 The condos are clean, organized, and outfitted with anything you could possibly need. Staying here has became our annual beach vacation tradition. We love it, the kids love it, happiness for all. The pools, lazy river, and beach are fantastic. I cannot recommend this place enough. Waterscape is a hidden treasure. We have 2 young boys, ages 3 & 5 this year. Having the pools, lazy river, and beaches steps away provides a great variety of fun. Looking forward to many more years to come! What an amazing place! It was so nice to have everything you need right there in the condo for you. Also, the perk of having use of the paddle board and kayaks. Danica was wonderful to work with and even recommended restaurants and activities. Definitely hope to return to this unit again very soon! Great place to make memories with your family and friends. Had a wonderful experience! Fun for the whole family! Danica is great to work with. We will come back soon! This was a great place to have family fun. The condo was great and Danica made it even better by checking on us to see that everything was perfect,and it was. Best Place we've ever stayed! These was by far the best place we have ever stayed. The condo was beautiful and the pool and beach access was great. There is a amazing view. The owner was absolutely wonderful to work with. She made everything so easy and kept in contact. I would recommend renting from her to anyone. Great experience and will definitely rent again. Danica was amazing to work with. She answered all of my questions promptly and sweetly! By day 2 of our stay we had already decided to book again next year! Highly recommend her to anyone looking to book. The condo was very well stocked with anything needed to cook or bake while you stayed! Not a negative thing to say about our stay on the property either. We had a wonderful stay over the Christmas and New Year holiday in C505. Danica was so easy to work with from the booking process, throughout our entire stay. The condo was beautiful and very well appointed. We didn't want for anything. The condo has everything so well marked inside, too, it was just extremely easy to stay here. We have been to this area numerous times and stayed at many condos along the coast. But when we return, we will certainly be looking to come back to Waterscape and book with Danica. Waterscape C505 was ABSOLUTELY PERFECT!! This is a longer than normal review, but our family stay was so much more than our normal experience. Let's start with booking the unit through the owner, Danica. She is spot on with information regarding any of her three units in this amazing resort complex. She clearly has an understanding of "customer service." She shows a great deal of understanding for those who may have never booked a vacation rental as she clearly details what she offers versus renting through a vacation website, third party management company, or the resort. It's obvious her desire to keep quality high and costs to a minimum that she has done her research and provides such exceptional personal service. Parking in the deck makes access quick and easy. The unit we enjoyed (C505)was so much more than the already very detailed photo views available on the website. (We were allowed an unique opportunity to peek into the other 2 units before being occupied, as well.) All 3 units were VERY CLEAN, tastefully decorated, and family oriented. Stepping inside the door we were greeted with everything ready. It's as if you would find your hostess waiting for you, ready help to settle you in for the week. The bunk rooms are a big selling point for the children as they are able to go have their own space that is slightly whimsical, ample for comfort, yet very, very cozy! The two bedrooms were spacious providing all the storage you could possibly need and more. The beds, king or queen, Sleep number beds! There were ample bed linens, pillows, blankets, even a soft, cozy throw for each bedroom. The bathrooms were large, very clean, and well stocked. The laundry area inside the unit was so convenient. A beach cart and 4 beach chairs are owner provided with each unit, this eliminates those extra, often budget busting, rental fees from beach services in the high season and leaves less to pack in the vehicle any season! The kitchen is so well appointed! The appliances are up to date and very clean. Everything I needed was available. Talking with someone in a "commercially managed unit" who described and I quote, "barely having silverware," I knew we had chosen the right path by going with Danica in her unit. In addition to the superior personal service given to us by Danica, All the common areas, including the convenient beach access, were clean, easily accessible, well maintained, and well lit in the evening. The campus security was most of all welcoming, immediately helpful, and always friendly. There's no place that we have ever stayed in the Destin/Ft. Walton area that even closely compares to the kind of top level service and comfort we experienced by booking directly with a multi-unit owner, Danica, at Waterscape. If you are thinking about going to Ft. Walton any time of the year, act quickly to get in on the best condos without the high fees! Danica's units seem to be quite popular based on reviews written in the unit guest books, and we know why. Our family had already decided to reserve with her again same time next year before the middle of the week! The Emerald Coast is my favorite Florida destination, I have stayed in numerous condos in the area and C505 is by far my best experience! We were able to park in garage near the condo (no lugging heavy baggage!) The condo smelled and looked heavenly when we entered, housekeeping took an extra effort to make us feel at home. This was our second time staying in C505 at Waterscape, and we absolutely love it! And we're fairly certain that has to do with the owner, Danica. She is wonderful to work with, has thought of everything you could possibly need during your stay, and the unit is so clean and decorated appropriately to get you in a beach vacation mood! As long as we're vacationing in the area, we will always book with Danica at any of her units. She is, quite simply, the BEST! Every September my family takes a beach trip and I have to say that C505 at Waterscape was one of my top 2 favorite condos ever! Danica, the owner has literally thought of EVERYTHING! The advice, info and documents she provides were super helpful. The condo itself is fabulous! SO clean, well organized, beautifully decorated and with a gorgeous view of the pools and the ocean! The special treats she left for my two children were definitely a highlight and was such a special, personal touch. You cannot go wrong in renting this condo. This vacation was our second visit to this property. Three years after our first visit, the condo is still top notch! It truly feels like you are "at home," rather than renting somewhere for a week, due to the owners attention to detail. Wonderfully decorated, everything you could possibly need has been thought of, and most importantly CLEAN. The owner goes above and beyond, and is so easy to work with. I highly recommend this condo, and Waterscape, for those looking for a great family vacation spot! What an awesome time we had. From the moment we walked in the door we felt at home. The owner of this condo truly puts her heart & love into making sure her guests get the best. The grandkids absolutely loved this place. You get the best of both worlds. The great pools & the beautiful beach. Oh my gosh the extras that this owner provides is fantastic. Free beach service with cart included to transport your chairs and umbrella to the beach. The wagon was great for transporting all our food fixings & pool supplies. We could cook our meals on the grills at poolside & the kids never missed a minute of swimming. The kitchen in this rental is COMPLETELY stocked for all your cooking needs. The owner is wealth of information. She responds right away & if there is an issue she's on top of it. I am 60 years old and the owner of this condo made this beach vacation the BEST I've ever had. You will not regret renting one of this owner's rentals. There's to many extras she provides to mention. You will not be disappointed! My kids and I had the most wonderful week! This was our second time here and we will return! The owner has thought through every detail and is very contentious to ensure that everything is perfect for our stay! I can't imagine a more comfortable, beautiful, and relaxing place to stay for a week with my children!!! From the moment we walked in the door, we knew we had picked the absolute perfect vacation condo. The condo was lovely, the view gorgeous, and the personal touches welcoming. Danica was a joy to work with... responsive, detailed, helpful, and hospitable, even leaving a little gift for us. I have never had a more pleasant experience with an owner. I highly recommend this unit and working with Danica! Fantastic condo and great location! We had a great time in this condo. It was clean with everything in working order. The condo is right by the garage/parking which is convenient. The pool and close access to the beach is great for families and kids. The owner is very helpful and provides you all kinds of useful information. We had a great time at Waterscape and loved staying in C505. It was very clean and stocked with everything. The owner is great to work with. Would recommend to anyone. This is my second time to stay at this unit and soon it will be my 3rd. I can't imagine staying anywhere else in the near future. Every thing I could ask for in this cozy beachfront condo. Owner is awesome to work with and genuinely cares about her guests. Beautiful condo, great views, awesome complex!! This was our first visit to the Emerald Coast and our first stay in this condo. Loved it from the moment we walked in. Very clean, beautifully decorated, nice appliances, washer/dryer/etc. Owner has thought of everything. Very good to work with, very detailed and helpful. Loved all the attention to detail we have not had in other condos we have stayed in, from labeling all the light switches, remotes, etc, to helpful hints about the condo, grounds, how to get around, where to go for good food, etc. that were sent to us before our stay. The views from this condo were stunning. Would highly recommend! This unit was just perfect! It was clean and well decorated. I personally loved laying in the hammock on the balcony! The kids loved the bunk room and the cute monogrammed t-shirts Danica left for them. We enjoyed many of the recommendations made by Danica as well: Helen Back, The Buccaneers Pirate Cruise and The Gulf (just to name a few). She was super helpful and really helped to make our vacation as stress free as possible. Thank you for everything Danica!! We stayed at Waterscapes 4/15/17 - 4/20/17. The unit was immaculate! Let me just say that our friends were 2 units down from us in a property NOT owned by Danica, and there was a huge difference in the level of cleanliness and overall feel of the unit. I especially loved the Keurig to have my morning coffee! My girls (ages 3 and 5) loved the adorable bunk beds and watching their morning cartoons on the comfy couch. Danica was so easy to work with and as a HUGE BONUS was able to get us in to our unit much earlier in the day than expected! She also had monogrammed shirts waiting for my girls that were SUPER adorable! She really goes the extra mile to make sure you are happy! We will be booking again! I don't normally leave reviews but we were so pleased I just had to. This is absolutely the cutest, cleanest, most amazing condo I have ever stayed in and I travel a lot. Danica was so sweet and easy to work with. 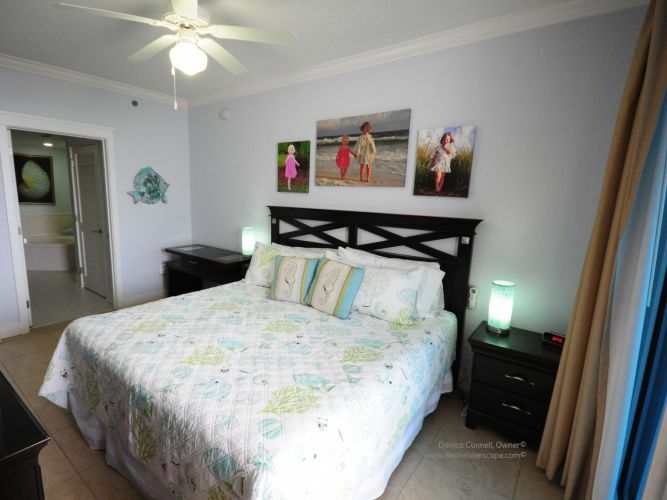 This unit has everything you could ever want from the sleep number beds to the beach chairs and carts to the beach music playing upon arrival. Also the monogrammed shirts for the kiddos was an extra special touch! We will definitely be back!! Thank you Danica for a FABULOUS stay!! We recently spent an absolutely amazing week in condo C505! Danica takes great pride in ownership and that shows from the second you walk in the door! The condo was clean, wonderfully decorated, and had everything you would need for a week of relaxation! The view and the sound of the waterfall is heaven on earth(I could sit on that balcony all day long)! It was so nice having beach toys, chairs, and an umbrella provided! We spent our mornings at the pool, afternoons at the beach, and our kids favorite part was going for a swim at night in the heated pool! We have stayed at previous condos that were dirty, dated, and the beds left you needing a chiropractor! You won't find that here! Everything is well cared for and the beds are great! We all agreed it was our favorite, most relaxing vacation so far and we can't wait to come back! Thank you so much Danica! Amazing Condo at a Fabulous Complex! I can not say enough wonderful things about Danica, the condo and the resort! Danica is so well-organized and thorough! The entire booking process was simple and quick, and she is excellent with prompt and detailed communication. I appreciated her attention to details in our pre-departure packet as well as her suggestions on places to eat and things to do. All of her suggestions were fabulous! Her condo is in excellent condition and decorated so well. 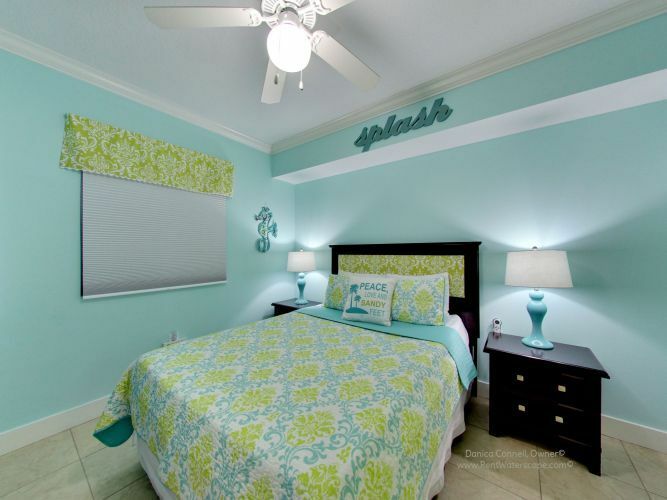 It is well-stocked with basic home items as well as everything you need for the beach and pool. When we walked into the condo, there was beach music playing and a nice gift for the kids in our group.....what a special way to start off the vacation! Waterscape itself was amazing! Everything is so clean and everyone was so pleasant. The pool complex was a huge hit with my daughter. The beach is wonderful; clear water and the softest sand I've ever seen. I had worried a little bit that the "C" building was far away from the beach, but this was not the case at all. It was a quick and easy (and beautiful) walk, even for my 90 year old grandmother. Danica even gave tips on the best route to the beach and different pools. We enjoyed the facility and the area attractions: dolphin cruise, Gulfarium, putt-putt, arcades and more. I would highly recommend this condo and hope to return in the future myself! Beautiful Condo! Beautiful View! Absolutely Perfect! This was our second time in this same condo and it was just as perfect as the first time! This unit has so much to offer. It is decorated perfect with a nice beach theme. It is stocked with so much that you feel like you are in your own home away from home. My kids enjoy all the beach toys that are there for them to use, the hammock on the balcony, and the grounds of this beautiful facility! Danica is such a pleasure to work with. Such a smooth process all around with great recommendations about the area. We will definitely be back for sure! Danica is so easy and wonderful to work with. I have never booked a trip and had someone respond so quickly. Checking in is so easy because you bypass the front desk! She takes pride in her condo and you can tell by the details involved from the beginning, when you book, during your stay with a clean and organized condo, to the end with easy checkout. I received my deposit check very quickly as well. The property is perfect, right on the beach and the seasonally heated pool saved our vacation! Thanks Danica! We will be back! First of all, Danica was great to work with. She communicated within an hour to answer any questions I had. The condo was clean, organized and decorated nicely. We are snow birds, so we really appreciated all the extras the condo had. We have stayed in other condos in this complex, and Danica's is by far the best! We will definitely be back! Love waterscape! Best owner, best properties! We have rented from Danica two years in a row. Both times, no disappointments and we have learned that she and her units are THE BEST! After chatting up with other guests and hearing their stories about their units/owners, I've realized that we likely will never book with anyone else. Details are thought of, she is easy to communicate with, and Waterscape is simply our place. Pools, beach, everything is top notch. We also love her two units because they are right off the parking garage. We had toddlers both years and the long walk with bags, kids, stuff was not very convenient. Kids love the bunk beds too! Overall, we just love this place, plan to return every year we can and will always book with this owner! We stayed in one of Danica's units over NYE 2016/17. We have 4 children ranging in ages from 14yrs to 15 months. I don't know if there is a more well appointed unit and resort to fit our family's needs than her units at Waterscape. The owner takes care of every last detail you can think of with respect to communication, arrival, departure, resort procedures, local restaurant & shopping tips... everything. All that is before you even set foot in the unit, which, speaks for itself as soon as you walk in. The condo is modern, clean, and clutter free (and that's important with kids). The sleep number beds are extremely comfortable, and linens are provided for you (lots of condos don't do this without an additional charge). As a large family, I fully appreciate a well appointed kitchen... at this condo, we had access to non stick pans, cooking utensils, stand mixer, coffee pot, tea kettle, crock pot, measuring spoons & cups, 5 quart stock pot (who doesn't love the local seafood), and more than enough place settings for multiple meals. Having a high chair in the unit for our mini-typhoon??? - AWESOME. What's really over the top - Everything you could need is in the unit for the beach, chairs, toys, wagons, cart, cooler, umbrella, literally everything except your own swim suit, sunscreen, and flip flops. When you don't want to hit to beach (uh... why did you pick a beach-front condo), there is a heated pool, 2 hot tubs, and splash pad that the kids can terroriz....errr... play at for hours on end. Sunset/sunrise views from this location on Okaloosa island are excellent. I have been coming to this area for over a decade, and I love this location (I spent many a night in the Hampton next door before this property was built). You can live here for a week without ever leaving the island. If you do decide to venture out, locally, it can be busy, but it's not absurd (see beaches in Destin during the summer) ... but you have access to Destin (20 to 40 minutes depending on where you want to go... an hour+ on days with crazy traffic) and everything offered over there as well. The million dollar question... would we come back? - Absolutely... as soon as we confirm what the 2017/18 school break schedule is, we will be booking with Danica again! This condo is the best of the best. As the mother of two small children, I was thrilled with the cleanliness and the lack of clutter. The condo provided a PERFECT pack and play, highchair, beach toys, chairs, umbrella, beach cart and wagon. It was SO NICE to have all of that provided and avoid packing it ourselves. Waterscape is the ultimate family-friendly resort so this perfect condo was the icing on the cake. This particular owner is awesome to work with and we hope to return as soon as possible! My family and I (me, hubby, daughter) just recently arrived home from the most relaxing and fun filled vacation. I can honestly say while the weather was perfect, the Waterscape grounds were beautiful, and the places we went to eat or visit were fabulous, we wouldn't have been nearly as relaxed or had as much fun if it hadn't been for Danica. She is absolutely wonderful to work with. Her attention to detail is amazing. The unit has everything you could possibly need. Literally, all you have to remember is your clothes, and some groceries if you plan on eating in. The kitchen is stocked with plates, bowls, cups, glasses, utensils, pots and pans, sheet trays, serving platters, a toaster, a mixer, a margarita machine, baking dishes, etc... there was even a roll of paper towel and some dishwasher tabs to get us started. In the bathrooms, there were multiple towels to use, hand soap, and a few rolls of toilet paper. And everything is labeled! You know exactly where everything goes, or what light switch operates what light or fan. The condo is decorated appropriately for a beach vacation, and it is so clean and clutter free. My daughter loved the bunk room. It truly is a hit with children! She also loved her bathing suit that was waiting for her when we arrived. My daughter was like, "Is this for me?! How did she know what size I wear?! Danica's the best!!!" My husband and I couldn't agree more. There were other, amazing extras that Danica thought of too...there were boogie boards and a beach wagon/umbrella/chairs to use, sleep number beds for a perfect night's rest, DVD players, an iPod, and a cool ocean book to look at/read, to name a few. We also took Danica's suggestions of different places to eat and things to do, and she did not disappoint! Anytime we had a question, before, during, or after our stay, Danica was always quick to answer, and was always so friendly. We loved our vacation so much, that we're booking with Danica at this same unit again next year!! We can't wait!! I could tell immediately upon entering the unit that this was the owners home away from home. It was spacious and detailed to a T. Once after settling in and having gotten over the euphoria, time for bed. SLEEP NUMBER BEDS TOO? You've got to be kidding me. Blended with the gulf atmosphere perfectly, already made reservations for next year before I even left. From the minute we walked in the door, we were in heaven. The attention to detail was amazing. as soon as we opened the door to go in, we were greeted by music, accent lights and a personalized sand pail for our grand daughter. There were beach chairs, a beach wagon, a pack and play among many other items for us to use. We were so happy with our condo, my husband booked that same unit for next years vacation. So far we have rented 4 different rooms at this facility and this one was by far our favorite. The unit was very clean and we'll maintained. The decor was lovely and the view from the balcony was way better then I expected. The beds in this unit are by far more comfortable then any of the other units I've stayed in. Also, the owner was very informative and a pleasure to work with. This condo is perfect! This was our first trip to the area with our two toddlers so I researched and found 505 cbuilding and everything I read was absolutely true! This condo was spotless clean and everything was in new condition. It has everything you need for small children including a highchair, full size washer/dryer and wagon! There was plenty of space for my little ones to spread out and play in the living room floor and I had no reservations about it as it was so clean. The kitchen is stocked with everything you could ever need. This was also my first time renting from an individual online. But the owner called me personally, answered all questions and we texted back and forth many times as she gave me so many helpful suggestions on places to visit close by! As mentioned in another review it is located in building farthest from beach but you are closest to parking(right outside of unit) but she explained all of that to me before renting. Highly recommend this condo to anyone looking at this resort! My family and I like to visit a new beach every year. This year's trip to Ft. Walton was just awesome. Danica was so easy to work with. She replied to emails and text messages within the hour and checked in on us the day we arrived and departed. The condo was stocked with everything we needed. It was clean, the beds were comfortable, the linens were very nice, the view was great! The pools are perfect for every age - especially little ones! The beach was easy to get to, clean and perfect for families. I do not think you will be disappointed if you choose 505c. This was the best, most well equipped, organized & comfortable condo we have ever stayed in. From the gorgeous decor, to the fully stocked kitchen and the top of the line beds/bedding it has everything you need in order to make it truly feel like home. One of my biggest fears is not being able to sleep well while on vacation, we didn’t have to worry about that with this condo...a sleep number bed, YES PLEASE! It was a dream come true, literally. So comfortable! There is a full size washer & dryer so doing a load of laundry was a breeze. Being able to park right outside the door to the condo was extremely convenient when loading/unloading the car. The grounds are amazing and my whole family loved the pools and the lazy river. This is truly one of the best locations for family fun. The owners literally thought of everything you would need to make your trip great. 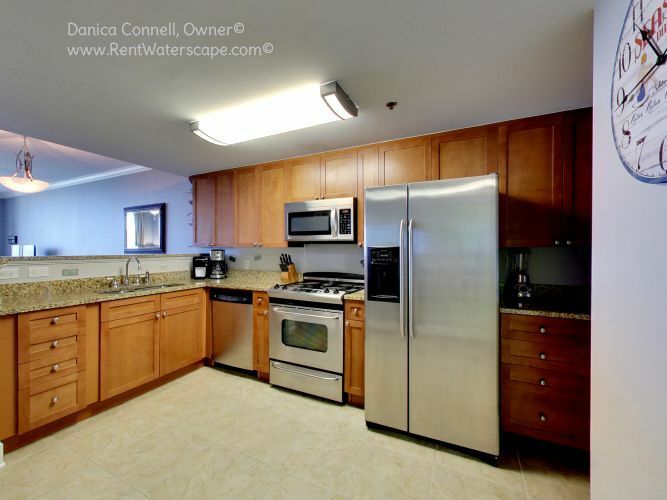 We really loved everything about this condo and I would recommend this unit to anyone! This condo is so well kept and very organized. Danica, the owner, makes things a breeze when working with her! The trip was stress free with all the help she had given us before arriving! We will be back in the future for sure!!! This condo was the best that we have ever stayed in. The location could not be any better. The decor was simply beautiful. I don't think that my family would be happy staying anywhere else on our family vacations! Wow...This condo was awesome!!! We love Waterscape and have vacationed here the last three years. Every year we have rented a different condo, this is by far the BEST! The decor is so cute, the pictures don't even do it justice. The owner, Danica, was wonderful to work with. She was extremely responsive and she couldn't have made the process any easier. Her special touches will leave you in awe. With out a doubt, we will be back! We have enjoyed this condo so much. Waterscape is a real gem--it's a 12 hour drive for our family but worth it. Owner Danica is an absolute joy to work with. Makes everything very easy. The unit is first class with attention to every detail. Also the location of this unit is ideal with great access to very convenient parking in the parking garage and a wonderful view from the balcony and the master bedroom. We have been here twice with our 4 year old granddaughter and definitely plan to go back. You will not be disappointed. It is a wonderful family place. Our family of 6 had plenty of room in this beautifully decorated condo. They provided just about anything we could have asked for...we just bought a few groceries and were set for the week. This was our second stay here in a condo owned by these owners and this time did not disappoint. We will definitely be back in the future! There was plenty for the children (and adults) to do, my girls had a great time and were asking to go back the moment we left. The condo itself was spacious, clean and just precious. Thanks Danica for going the extra mile to make us feel welcomed and going the extra step to make sure our stay was perfect. We cannot wait to go back! Just the most PERFECT place to stay! Every little aspect of our stay was flawless and comfortable from day one. When I first inquired about this unit Danikas response time was almost immediate! Her communication throughout exceeded my expectations. The unit was fully stocked with anything and everything that you may need in the kitchen. All the extras such as beach toys galore for the kids and the beach chairs/umbrella/cooler bag/wagon etc. were an added much appreciated bonus! The kids loved their little personalized surprise that was left for them! The Beach themed music playing as we walked in put a smile on my face. The view had to be one of my favorite aspects of this unit! The balcony with the hammock was also a favorite. There was more than enough room for our family of four. The sleep number beds were very comfortable. The bathrooms having the two vanities gave us our own extra space too. The parking convenience was also a bonus. The grounds are just picture perfect and all of the pools were better than I expected. The beach was incredibly clean and the sand was like sugar! Our stay was better than we anticipated and we will for sure be back to stay in this unit again! Danica was awesome to work with!! Her organization from the time I booked this unit until we departed for home, is something I truly appreciate. She has put a lot of thought and effort into making this condo a home away from home. Every detail has been thought out. From the moment we walked in it was perfect. We walked into beach music being played, and personalized gifts left for our kids. The kitchen is fully stocked with everything you would need and the beach equipment (beach chairs, over-sized umbrella, cart and wagon for transporting "stuff" and kids, sand toys) is very clean and organized (even though the rain kept us from using it, but none of us are able to control the weather). 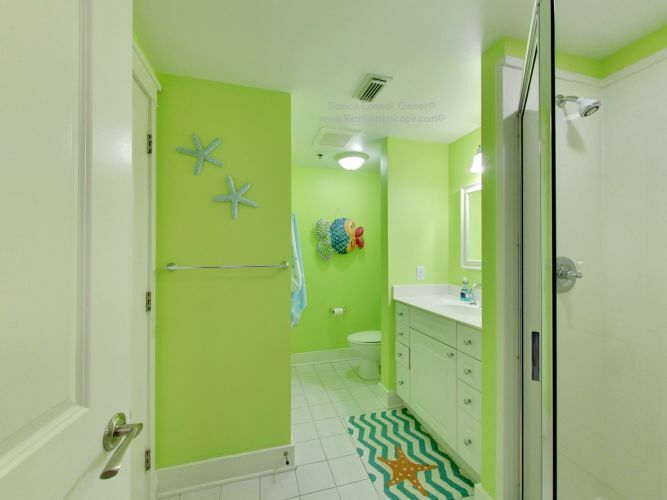 This condo is decorated in nice beach color and decor, rather than a "cookie cutter" condo like some I have seen. The Waterscape grounds are absolutely perfect for kids of all ages. Our children are 10, 6 and 2 and usually someone isn't happy due to lack of things for their age, but NOT here!! The older two have already asked if we can go back again. I will most definitely rent this unit again in the future. Even though it rained the entire trip, it has still been one of our best vacations, and for that- Danika we thank you!! This condo is first class and is extremely well decorated and equipped to ensure that your stay is hassle free and a home away from home. Every last detail had been considered and the owner has clearly thought of every possible scenario to ease your stay. The complex is also fantastic and absolutely ideal for families. Highly recommended. Our experience from start to finish was exactly what we needed for a relaxing and fun vacation. The owner was beyond thoughtful and thorough! No detail was skipped! Grateful for the fantastic memories! We love Waterscape and all it has to offer!!! We have stayed at Waterscape several times and this is our favorite unit yet. It was clean and decorated super cute and was stocked with everything you needed and more!!!! The owners were absolutely great to work with and we hope to return to this unit again. Our boys asked the night before we left to come home if we could please come back and stay here again next year! I would highly recommend this unit! Absolutely loved Waterscape and especially this condo. It was stocked with anything and everything we could have wanted or needed and the decor was so beachy and relaxing! We really felt at home. Beds were super comfy and the personal touches which the owner left for us made it a very special experience. Danika (owner) was very organized and responsive. She really went the extra mile and exceeded all expectations. We will definitely be back! We love Waterscape. 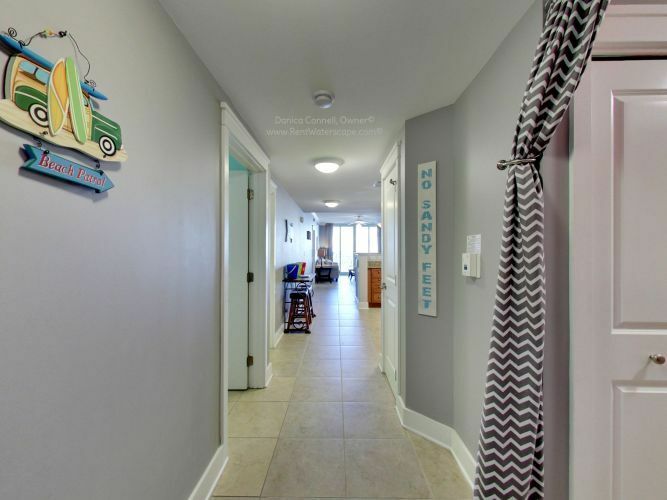 This was our first visit and this condo is awesome for families with young kids. We had 3 adults and a 3 yr old and two 1 yr olds. From the pack n play to the highchair, to the wagon, everything we needed. It felt like home. We are already planning a trip next year. Well worth every penny. When you have young kids, you never know what they will be in to or if the weather will ruin your plans. We had so many options, the beach, the lazy river, the toddler play area, the pool, the Gulfarium.. so close! It rained every day and we didn't mind at all! My family and I had been keeping an eye on this listing for a while....knowing we would eventually rent and just waiting for the right time! We just got back from our fabulous vacation today.....late August after all the hustle and bustle of summer. The water was perfect....the calmest and clearest I have ever seen it, and I've visited the gulf every summer for most of my life! Perfect sunsets and more nighttime crab catching than I have ever experienced! My son was on cloud nine! Now, to the condo..... Upon entering there was beach music playing - immediately welcoming us to our vacation weekend! Every single thing we needed was at our fingertips. There were even things that we didn't realize we needed that we found accidentally: a stool for our son to use at the bathroom sink. An extra fan in each bedroom (perfect for our 5 year old who is used to sleeping with extra sound). Pretty much any kitchen utensil you would need and each one designated to a specific spot with a label. (This was perfect for someone like me who completely appreciates being organized!) Special extras for us and our little one who was elated to find something JUST FOR HIM upon arrival! He was also beyond thrilled with the beach toys that belong to the condo and allowed for our use. Another major added bonus is the beach cart and chairs. Every summer we have lugged all of our beach gear down in our vehicle and then down to the beach by hand. This summer we were thrilled to have our own cart and chairs provided! There was also a large umbrella provided, but with my family's fair skin, we always bring a tent to shield our vampire skin from the sun! ;-) The beds: My husband has major back issues and woke up each morning telling me that he had no trouble on the firmest setting of these fabulous sleep number beds! I like mine a lot softer, so it was nice that we could agree to disagree on our settings! Grounds: Lazy River, Splash Pads, poolside grills, Fudpuckers! Location: The first day we were at Waterscape, the weather was more perfect than we could have asked for. The next day it rained off and on. We planned for this. We visited the Gulfarium and the Air Force Armament Museum. We loved both. Each family member had a different favorite, but all were thrilled with the entertainment of both. Not to mention, we were able to walk to Waffle House for breakfast! ;-) All in all.....this condo can NOT be beat! We just got home and have already booked our next trip! This is a stellar review!! Thank you so much for taking time to write the details. And a little thanks for the extras goes a long way. I work hard in my units and appreciative guests make every effort worthwhile. Our family had a wonderful time, the condo is immaculate and beautiful. The cart, beach chairs, and umbrella were a great bonus, made things so much easier! Everything is labeled, so finding/putting things away was a snap. The bunk room is totally adorable, our kiddo would only come out to go to the pool! This was by far the nicest condo we have stayed in for our yearly beach trip. We will definitely be back! This is a comfortable condo with all the amenities! The beach cart is SO HELPFUL, and the beach umbrella and chairs are just perfect. 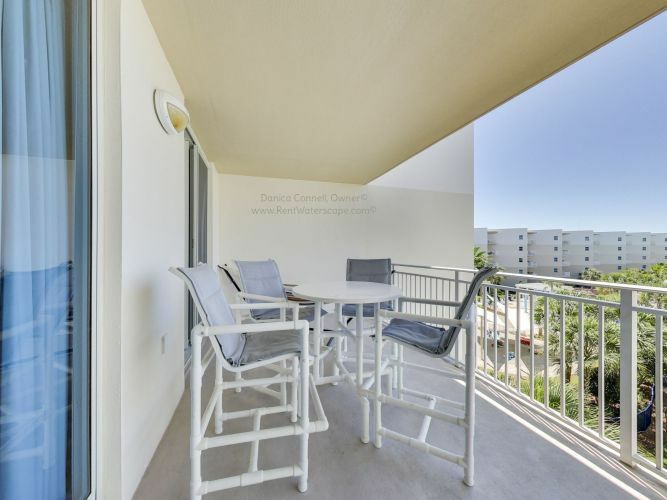 The owners of this condo provide GREAT detail on where everything is, how everything works, and even the most efficient routes to the beach from the unit! Can't say enough about her org skills. PLUS...we've usually stayed in Destin, but Fort Walton Beach is a gem and we'll definitely revisit the area. 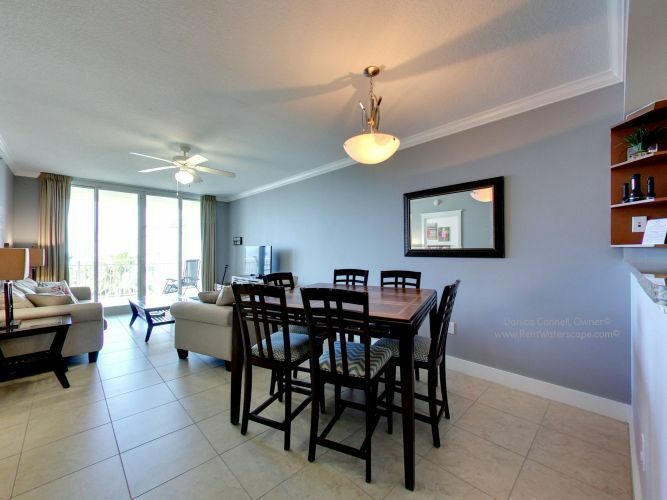 This condo was an integral part of a fantastic trip to the Emerald Coast! The condo was great! We arrived to a very clean, organized and well decorated condo. When I opened the door the beach boys were playing and that set the mood for the entire trip. The sleep number beds are the best. This was the best vacation sleep I've EVER had and I owe it all to the sleep number bed in this condo. The beach cart complete with umbrella, chairs, and cooler is another awesome amenity in this condo. It was easy to use and saved us money on a rental. We had a great time and will definitely be visiting again. The condo was great! The view was great..perfect view of the "kiddie" area, upper pool, and most importantly the ocean. The location was awesome not only for the view but parking! The ability to park basically right outside the door of the condo was incredible!! The beds were wonderful and my daughter loved the bunkroom. The kitchen was nicely equipped, we loved the fact there was a crockpot and used it the first day we were there :) Another thing I loved was the personalized towels the owner left for both my kids...so sweet and very thoughtful!! Highly recommend this condo!! Super cute and awesome with everything you need for fun! Our group loved this condo! It had everything we needed to feel at home plus there were personalized goodies for the kids. How nice is that? Our favorite amenities: sleep number mattresses, cuisinart, hammock, margarita machine and the view from the balcony. We will definitely be back!!! We LOVE Waterscape and have stayed here 3 other times (in 2 different condos). When I was searching VRBO and determining if we would return to the one we had rented the prior 2 years, I came across this one. The first thing that caught my eye was the adorable set up of the bunk area and large kitchen. 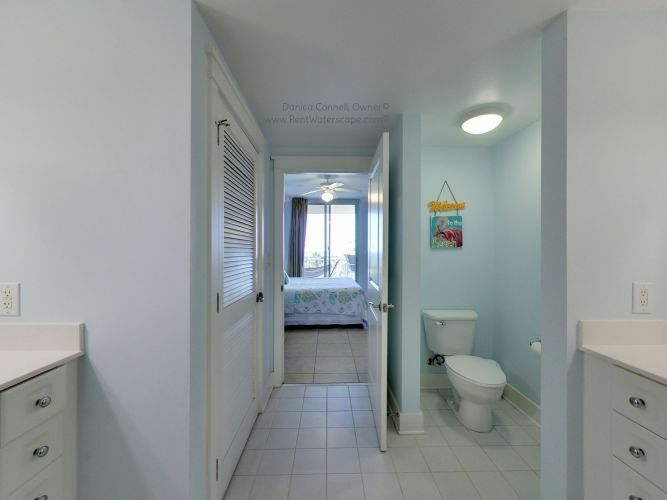 As I read, I was intrigued with the amenities, price, and overall reviews on how CLEAN it is. We always go at peak season in June and I have just gotten used to the fact that I bring along my own cleaning supplies, because frankly have never been in a condo/ hotel that was quite clean enough for me (esp at peak season- I mean a little sand seems natural, right?). Well not here! In fact, I never used my cleaning supplies except wet wipes to keep the counters wiped as we stayed throughout the week. The first thing my husband said when we entered was, "wow! Look how clean the floors and tile are". We are a family of 4, but it was not much more to have the extra bedroom vs the usual 1 bedroom with bunks that we had done in past. My daughter and son decided he would take bunk area and she wanted the queen bed room. There was plenty of dresser space for both of them in that room, which meant less rumbling through suitcases for them (they are 10 and 7, so that was a big improvement from past years). We slept very comfortably in our bed. There really is no detail left out at this condo! The beds are "special", the couches actually clean and comfortable, all kitchen items provided, the hammock is wonderful, and the décor is top notch! The owner even has a wonderful "summer mix" in the CD player, and we enjoyed when it came on for us that first day. My kids were thrilled with their gift that was left for them! We did not use the beach umbrella or cart, but it looked great. We used 2 of the beach chairs and they are comfortable and sturdy. This owner is very responsive and will reply quickly. We were able to get into condo about an hour early, but even if you can't, take it as an assurance in knowing they are cleaning and preparing your condo in what I would say is 10x's better than any other. Cute, Cozy & Comfy on the Beach!!!! Need I say more? Excellent stay! Plan to go back again! Such a fun, cozy & clean condo! Best stay on the beach yet. Owners are excellent! Pay very close attention to detail & go the extra mile to make sure your stay is "top notch"! Walked in to clean, cozy decorated condo that smelled wonderful, playing beach music! Totally put us in the beach vacation mood. Texted the owner once due to minor issue with beach cart. Expected not to be fixed until after we were long gone. Within 15 minutes someone was there with a brand new beach cart!! Excellent customer service!! Highly recommend this condo & owner!! We traveled with a large group and rented 3 condo's total, this condo and another with the same owner and a third with a different owner. There was a HUGE difference in the units owned by Danica and the other one. She works so hard to make it feel like home! It is decorated so nicely and stocked with anything you may need; plenty of towels/washcloths, tons of kitchen utensils/tools & small appliances (blender, mixer, crockpot, etc. ), high chair, pack n play, even nightlights...lots of little things you can live without for a week, but made the week much more comfortable and enjoyable because they were there. She pays attention to the details and takes wonderful care of her units. The other condo that part of our group stayed in was not as well kept, very little supplies and obviously not as much care put into the unit...one of the headboards was not even attached to the frame and leaned and moved any time they touched the bed. Danica is also extremely responsive with any questions you may have and provided us with great information on everything from the best place to park, best way to get to the pools and beach, to restaurants and activities that we might enjoy. The unit also has very nice beach chairs and umbrella with a cart to get it all to the beach easily. I really appreciate this review. When we bought our first unit here we spent an entire day tightening loose screws. Knobs were missing, lights fixtures were broken, screens were ripped, and some of the ceiling fan blades were literally about to blow off the fan. And this is how it came, straight off the ResortQuest rental program. This is how they "care" for your unit. In addition, total lack of owner care was apparent. We immediately pulled the unit off of the rental program and took over management ourselves. When we bought our second unit at Waterscape, we shopped harder, looked at more. Out of 33 units we looked at, 25 had a cracked kitchen light (something we experienced in our first unit). So yes, the lights are crappy, but 25 owners have done nothing about it. That, to me, is much more disturbing. Most people see the unit they are in and have nothing to compare it to. I am glad that you have pointed out some of the benefits of my units. We work extremely hard in our units, and it is not easy keeping it in top notch shape when you have renters almost year round. Both of my units will always be this way. When I tire of it, I will sell them. Thank you for the review. Remarks like these give me the fire to keep this up. I would love to have you back again. Our family loved this condo. Danica made the rental process very easy and she was full of great recommendations and helpful info. The personalized gifts for our kids were so nice and thoughtful. The condo's close location to the parking garage was really convenient for unpacking our car. The condo was very clean and contained all of the little things you might need including items for a baby/toddler (pack n play, highchair and float for pool). The location of this condo is perfect for little kids. The splash place is steps away and our kids loved it. The zero entry pool, lazy river and beach are just a short walk from the condo and also a lot of fun for kids. The Waterscape pools and grounds are also extremely clean. There were workers out every morning cleaning the pools, grills and grounds. We are already planning to come back next year. Thank you Danica! We could not have asked for anything better. My young kids loved the amenities (splash pad and the pirate ship slide)! It's such a family friendly environment. The condo was well organized and we enjoyed not having to pack a pack n play!!!! When you work with people who immediately make you feel like family AND THEN stay in their home that feels like your own - there is no other way I would choose for myself and family of 5 to vacation. We will most definitely be back! Loved this condo!!! So nice walking in condo with beach tunes playing and personalized buckets for our kiddos. Lovely decor, clean, and well stocked kitchen. Loved ground floor for kiddos and all the toys and beach/pool gear. Will be back!!! Owner is very helpful with providing detailed information from signing contract to departure. The condo was clean, nicely decorated, the pools are perfect for kids and adults and the beach was beautiful. Absolutely beautiful condo - perfect for young families! From the first contact with the owner through to our departure has been A++. She is responsive, proactive and accommodating with exceptional customer service. The condo we stayed in was perfect from every detail, decor, linens, cleanliness and everything you would ever need being away from home. We cannot say enough! We went a with a group and I was able to see other condos. The quality and aesthetics surpassed all by far. 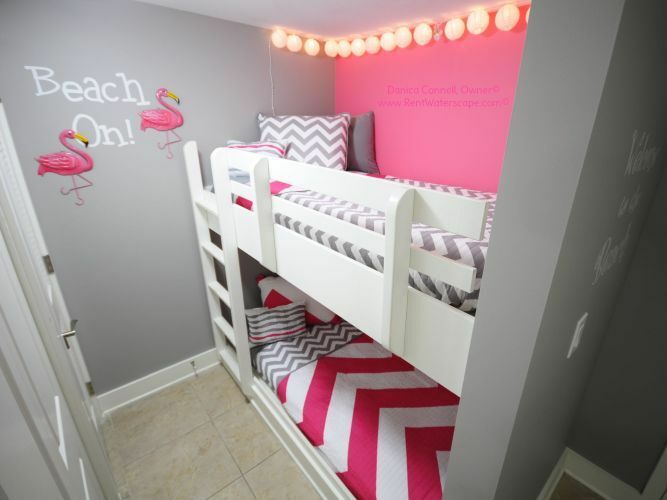 Our girls LOVED sharing the bunk room with pink and grey decor and lantern lights! This owner clearly knows what it is like to travel with children as her condo is equipped to please the whole family. The personal details and touches were incredibly appreciated by us all. We enjoyed the view of the gorgeous grounds and the gulf! The amenities of the resort met all of our needs (we would have liked a little more warmth in the large pool and lazy river... however, not a concern). When we return to this region, we will most definitely book with this condo! My family had a fantastic time visiting friends in the FWB area. Your condo was great for the 8 of us. Well organized and very clean. The children loved their towels and throughly enjoyed all that Waterscape offered. We will most definitely rent from you again. We had a wonderful stay at this condo. Everything was very clean and super comfy. The bunk beds and the hammock were a big hit with the kids. The pools were clean and well maintained. We loved our trip and hope to be back soon! We had a great vacation. The weather was nice and the beaches were beautiful. After a long, cold Minnesota winter, it was very relaxing hanging by the pool watching our children swim or lounging oceanside listening to the crashing waves! Our condo was perfect and the view from our balcony was fabulous. We can't wait to do it again. First time stay but not the last! Being recently retired we were looking for a winter get away condo for a month . After viewing several areas and resorts we decided on this one and couldn't of been more pleased. It was everything the pictures showed and more. The kitchen had everything we could possibly of needed and we did a lot of cooking. Loved having the parking garage where we parked only steps away from our door. The resort area is so clean, well maintained, and secured. It is in walking distance to shopping, restaurants and beach walking. We are missing the fabulous views we enjoyed daily from the balcony. I would definitely recommend this unit for families or couples. You will NOT be disappointed! Loved it! Hope to return next year. Perfect unit and perfect vacation! We had such a great experience in this condo. It is soooo nice. The colors are relaxing and peaceful and beachy. The owner is magnificent to work with. She has everything you could ever need in a beach condo. This kitchen is better stocked than my own. There was even a kitchenaid mixer. I did not have to buy any "extras"...everything was provided. The unit was actually better than the ad states. We were the first guests to use the new beach service provided in this unit. I have to say it was WONDERFUL. Having chairs that we could set up anywhere we wanted was huge. Also each chair as well as the beach cart has cooler space. We threw all our beach stuff into the beach cart and didn't really have to carry anything the entire time. Waterscape is so nice. The grounds are excellent. The security is a huge plus. Everyone was so nice. I actually got to relax on vacation. I would highly recommend this unit and hope to stay here again myself. Danica goes above and beyond what an owner has to do. I have never seen a rental property cared for at this level. Amazing. Totally surprised by this unit!! A friend recommended this unit to me and I sort of took her word for it without doing much research on my own. She had told me all the wonderful things and so I expected it to be great. But, it still exceeded my expectations. The resort was amazing. If you want a place to relax, this is it. The unit--absolutely impeccable. EVERY detail was tended to. I have not seen a vacation rental so well cared for. I felt like I was in my own home. Everything I needed was already in the unit! Also, the unit was very clean. I will definitely be back here!! Thank you for a wonderful vacation!! I'm looking forward to visiting again. My business partner & I rented the condo for the month of November. We split the time. My husband and I have 2 small boys! It was perfect for us! There was still plenty to do in November with the boys. Heated pool, playground area for toddlers, beach, shuffle board etc. The condo set up was great! Master bed & bath separate from 2nd bedroom & bath. The master bedroom had plenty of room to set up the pack & play. Since we were down for several days at the time we cooked a lot. I have never stayed somewhere that had any utensil, pan, kitchen tool you could possibly need! Everything thing was thought of when it came to stocking the kitchen!! I would highly recommend this condo to anyone. The owner was GREAT to work with too. We will be back! If you are looking for a great vacation experience at the beach this is it. Danica, the owner is great to work with. Beautiful condo with an awesome view. Had a small problem with the wifi but a quick call to tech help and problem resolved. Could not ask for a more relaxing vacation. The pools, the beach, the condo, the shopping the restaurants, all word class. Awesome! We've stayed at Waterscape before and knew about all the amenities the resort offers. Great family environment with a ton to do for all ages. We specifically loved this unit. Danica has all the extra's you don't normally get while on vacation. She takes great care to ensure the unit has everything you need for a wonderful week at the beach. She provides all the information you'll need to know about the unit, the resort, and the area. We'll be back, hopefully every year. This was a great, family oriented place to stay! It was clean and filled with everything we needed! Loved my stay at your condo. The condo was beautifully decorated and the family atmosphere was awesome. My grandkids loved the lazy river and the toddler pool. The weather and ocean cooperated with us too. Thank you and will visit again. We had a blast staying here! The condo is decorated so cute! Even the towels are match! :) It has everything you need in the kitchen! The pools are a plus also! I would recommend this condo to anybody! I stayed in this condo for 4 nights in August and it was truly delightful. This was my second stay in this unit. The owner just installed new tile and it looks fantastic! Every detail was thought over with care which is why I stayed here again. I have been coming to Waterscape for years and this is my favorite unit and I have no plans of looking any further. Love it!! Absolutely just love it!! The condo was perfect! High quality linens and kitchen accessories, NEW tile, equipped with kid-friendly extras (wagon, pack and play, beach toys, and even a kite!) beautiful view, not far from the beach, and the resort was perfect. We brought our 17 month old and 4 year old and had a wonderful time! Morning at the beach, lunch by the pool, playtime at the water playground or zero entry pool or lazy river, nap, dinner, crab hunting on the beach/night swim- then repeat! The resort was well taken care of (the grills were super clean), good work out room, and everyone from the property were very friendly. The owner was VERY helpful and it is obvious that they take great pride in their condo. I recommend that you walk the pier at sunset (1/2 mile down the beach or short drive) where we saw a HUGE sea turtle and 6-10 dolphins. Also, check out Harbortown in Destin for the fireworks. Food Recommendations: Dewey's, Stuby's Seafood Shack, and Shakes (for dessert). I can't WAIT to book next year! We had a great vacation our first time at waterscape. The booking process was very convenient and easy. The condo was very clean and nicely decorated! I love the privacy curtain on the bunk area. There was a pack and play in the unit for families with toddlers. Danica left personalized gifts for my boys. Wonderful experience working with owner; before and after we had to cancel! This review made me laugh out loud because I don't feel deserving of all that. This renter couldn't review my condo so she just reviewed me instead. I'll take what I can get. haha. Thank you for your kind words Autumn. We loved this unit and dealing with its owner was all-around an enjoyable experience. My wife and I took our married daughter, her husband, our precious granddaughter, along with our adult daughter and just had a wonderful time! The unit was incredibly clean and well-organized. The pools and lazy river, along with beautiful beach access make this a place we'd love to come back to. Give them a call. You won't be sorry! We absolutely LOVED our stay here! The decor was top notch, everything was clean and organized (even the light switches were labelled! ), and no detail spared. Danica was thorough, friendly, and extremely helpful to work with. I don't have enough positive things to say about our experience here- it was just wonderful and we can't wait to go back! We had a great time with the kids at this condo! The resort offered a full variety of activities as well as a water park, lazy river, and large pools! The beach wasn't in the best of conditions due to storms bringing in some seaweed, but they were as good as can be expected after a rough storm. The pool area definitely filled that void. Would recommend to families and vacationers of all ages. We plan to stay again! My family and I recently returned from a wonderful vacation at Waterscape. The condo was everything we hoped it would be. It was decorated so lovely. It was well stocked with everything you could think of, and some things you would not have thought about! We loved the C building and this condo. The view from the balcony was great. You can see over the entire resort pool area, and have an ocean view in the background. Many naps were taken in the hammock. Parking was literally steps from the door, which was so convenient for loading and unloading luggage. The resort itself was fantastic. It was very well taken care of and clean. With several pools, kiddie areas, hot tubs, and lazy river, there was something for everyone. The beach service was great and easy to use as well. We were thrilled that was included! Several restaurants and a grocery store are close, and Destin is just a few minutes away. The location is great. The booking process was a breeze, and the owner is wonderful to work with. She is very responsive to emails and texts. She even had a special gift for my son waiting on our arrival! We accidentally left a watch at the condo when we left. She contacted us as soon as it was found and arranged to mail it back to us. A great VRBO experience. We are hoping to go back again! We just returned from an amazing family vacation at Waterscape. This unit and resort are first class. The condo had everything we needed during our stay. It was wonderful working directly with the owner. Her attention to detail, timely response, all-inclusive pricing, and lovely unit were beyond compare. It is tastefully decorated and has lots of extras (all-terrain wagon, beach cooler, flashlights for crab catching, beach toys, and my kids favorite...Margaritaville blender for virgin daiquiris!). We can't imagine finding another unit this nice. The view was amazing and it was an easy walk to the beach. We walked across the street and had a great meal at the Old Bay Steamer. We also walked the beach to local restaurants The Crab Trap and Black Pearl. We ventured to Destin (a very quick and easy 5-10 min drive) to do the Sea Blaster Dolphin Cruise...definitely a highlight! We also highly recommend Harry T's restaurant in Destin. However, we spent most of our week onsite at Waterscape. There is something for every age and our kids never tired of the beach and all the fun pools. The parking garage is very safe and right next to the unit...easy in and out. There were several grills on the property and a Publix grocery very close. We enjoyed grilling out. We are so appreciative of this quality time we just shared as a family and we can't wait to go back to Waterscape and stay in this unit. After we returned home, we asked our 11 and 7 yr olds if they would rather go back to Waterscape, or to Disney, on our next vacation....they chose Waterscape! One of the Best Places to Stay!!! AWESOME!!! This is an excellent place to stay. Very convenient location to Destin and other areas surrounding Fort Walton (if looking to site see). This condo is very comfortable and cozy with all of the amenities you need in a home away from home!! There were so many details put forth within the condo that made our stay even more wonderful!! We will definitely be staying here again. We really enjoyed our stay at your beautiful condo! Our favorite amenity was the covered, back door parking. We found the condo very clean, well-equipped, and just as described and shown in the pictures. The four of us adults enjoyed the heated pool, hot tub, and pristine white sand beaches, but Waterscape is a wonderful place for kids too. We'll be recommending it to our friends and family with children. The owners are super organized, thorough, and easy to work with. During our stay, we also enjoyed a tour of the Air Force Armament Museum at Eglin Air Force Base, did some shopping in Destin, and had a delicious meal at Floyd's Seafood House. We will definitely be visiting again soon! This is the best resort on the Gulf Coast that I have been to. I recently visited here after a recommendation from a friend, and it was everything she said it would be. The grounds are amazing. The pools are also amazing. There is something for every age. This unit was absolutely fabulous. It was clean and the kitchen was terrific. For once in a rental unit I had everything I needed to cook. The items provided were great quality, nicer actually than in my own kitchen. Each room had its own personality was everything was nice quality. Beds were comfortable. I couldn't ask for more. We walked down to the fishing pier and there was a beach playground. There were lots of good places to eat and shop nearby. The owner was extremely organized both with the unit and with the booking process. She was quick to answer our questions and her "Free Advice" was right on target. I highly recommend this resort and condo. Thanks for a great vacation!! Wonderful Condo, no detail left untouched, best trip ever! I have been to Waterscape 14 times and I have never seen a condo cared for as impeccably as this one. Not only is the owner's taste fabulous, this is the CLEANEST condo we have ever stayed in. What we loved: **The decor and colors. This place is beachy and classy. Not junky and cheesy. I loved that we had everything we needed, but not a lot of junk setting around. Everything feels fresh and clean. **It's well stocked. We had plenty of linens. There were extra towels, pillows, blankets. There were glass dishes for the inside, and plastic dishes to picnic by the pool or on the patio. Same is true for serving ware. There is a margarita machine that made fine margaritas and there were even plastic and glass margarita glasses. There was a cooler for us to use on the beach, and a wagon to pull our kids around in. There were even flashlights for crab hunting. **The location. Back door covered parking. Enough said. **The view. This is the most relaxing view I can remember. It's far enough back that you don't hear a lot of noise, but you can hear the waterfalls from the pools. You can see the beach and get some afternoon sun on the patio. I fell asleep on the hammock on the patio more than once. Oh yes, THERE IS A HAMMOCK ON THE PATIO! It was the only one I saw on the whole complex. Superb!! **The price. We got a fabulous deal! **The owner was helpful, prompt, and kind. Thank you so much Danica for all of your help! We'll be at THIS condo for my next 14 visit. This condo is a jewel!! My husband and I brought our 2 kids to stay at Waterscape for a quick weekend beach trip. I don't usually write reviews, but after staying here I felt I HAD to let others know how wonderful it is!! First, I'm picky about the decor in the condos I stay in and I just fell in love with the decor in this unit!! It's so beachy, but not tacky like most others. The roomy kitchen was a huge plus. The kids loved the bunk area and especially the lanterns lit up at night. The keypad was great on the door, we didn't have to keep up with a room card along with everything else you have to keep up with at the beach!! The booking process was super easy and the owners gave me all the info I needed to ensure we had a great stay. There's a GREAT restauraunt across the street (Old Bay Steamer) that we were able to walk to which was awesome! We will definitely be coming back to this condo in the future!